When choosing a saw file, it depends on the type of saw, the number of teeth (TPI) and this then governs the size of the teeth. Filing the teeth removes a layer of steel which restores the sharp cutting edge. When sharpening a ripcut saw, the teeth are sharpened to a chisel tip. When sharpening a crosscut saw, the inside of each tooth is sharpened to create two bevels resulting in a three-sided tip point. The saw file can be used for both tooth patterns. If you are struggling to keep the angle consistent when using a saw file, you can use a strip of wood with marked angles on as a guide. If you find you have set your saw too aggressively, you can file them back to an upright position and start again. Ensure you are using the same length stroke, the same hand pressure and the same number of strokes per tooth to get an even pattern. When buying a saw file it is important to ensure it is tapered and that the width of the file is double the height of the saw teeth. Paul recommends Bahco saw files as they are long lasting and well made. Saw files technically have 6 faces, not 3, this creates a cutting face that reaches into the bottom of the gullet. Each corner is not a point, they are small flat surfaces which have teeth on, this makes the cut more effective. You can buy saw files for less than £10 each and usually can sharpen most saws with a 4”,5” and 6”. You should never use a saw file without a handle as the tang can puncture the skin if used incorrectly and cause serious hand/arm injury. 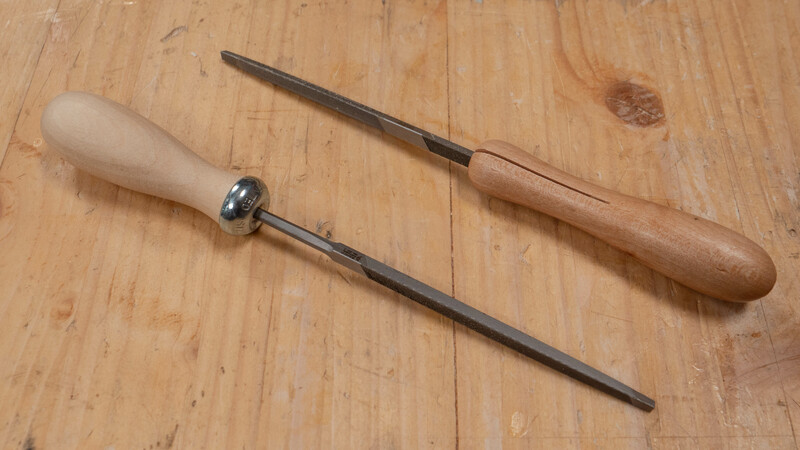 You can get 2 types of handle, one for a double ended saw file which has slots which allows the file to wedge into the handle, or a handle for a single ended file which is shaped to house the tang. 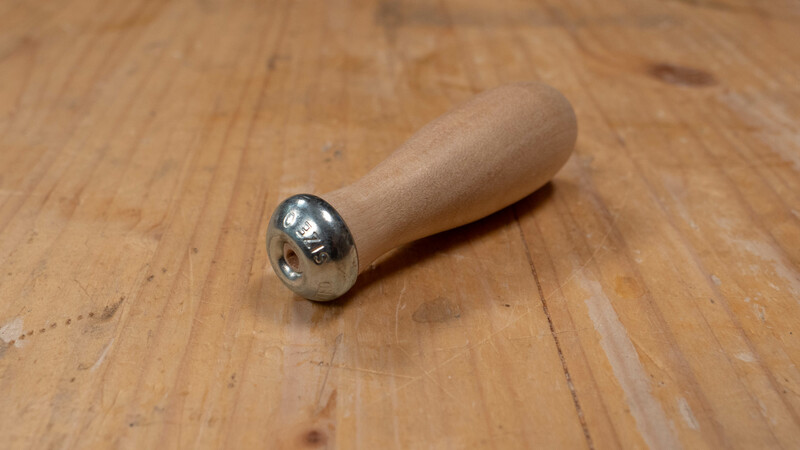 You can get file handles which are made from wood or from plastic, Paul prefers using the wooden handles. 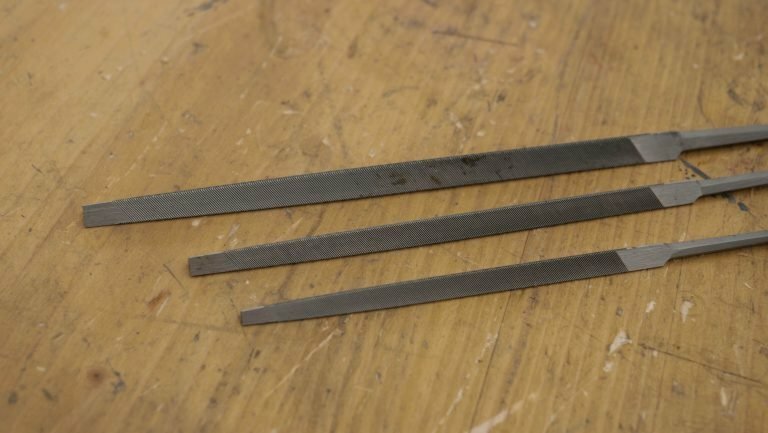 You can also make your own saw file handle following Paul’s blog. You shouldn’t have to pay more than £3 for a saw file handle, we have purchased this one of eBay for £2.64* free delivery which fits our 4”, 5” and 6” saw files. We purchased these Bahco Slim Taper Saw Files from Amazon for £5.88* each with free next day delivery. *Prices correct as of February 2018. Thanks for defining “Fleam” cut. Never heard the term before. I’m pleased to hear you’ve found them useful! In this post, you use tpi (teeth per inch) and ppi (pints per inch) seemingly as synonyms. In my mind they are – if you have 5 teeth you have 5 points. Do they indicate the same or is there a difference? There’s a lot of discussion on the net about it but its all based on opinions.. If you have 5 teeth you have 4 points, however, 4 and 5 are used relatively as there is such little difference. You can use TPI and PPI interchangeably without worrying about the nomenclature .